These .030" (0.8mm) PVC blanks are pre-sized and can be sheared, stamped or profiled after printing to create custom shapes. 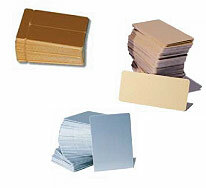 Sold in quantities of 100 blanks/pack and boxed 500 blanks per box. Please note that Tan and Grey cards are flood-coated products with color on the front side and white on the back. DCS can also supply you with .060" (1.5mm) PVC blanks and PVC sheet stock. Please contact us for custom-cut blanks, or if you require adhesive on any side. Each part includes 2 nametags with .125" (3mm) radius corners. These tags snap apart after printing on one pass. Use with Badge Holders BH-030-05-14-I or BH 030-06-14-1-I.